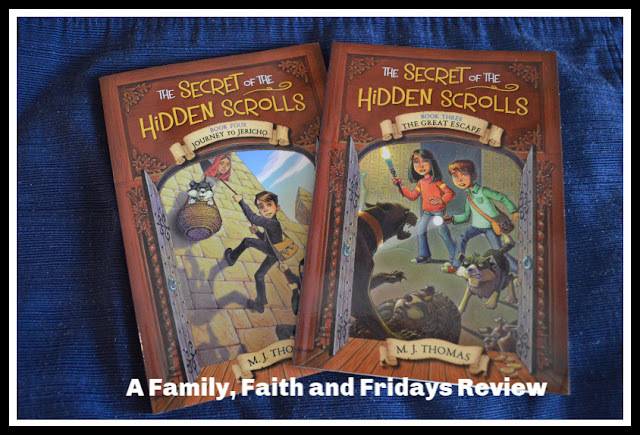 Last year after reading Books One and Two of the Secret of the Hidden Scrolls from WorthyKids, an imprint of Hachette Book Group, Colby and I began anticipating when the next two in the series would be published. They are finally here and we are so excited to share a review with you! The Great Escape (Book #3) and Journey to Jericho (Book #4) did not disappoint. Written by M.J. Thomas, these two paperbacks, about 120 pages each, continue the adventures of siblings Mary and Peter and their dog Hank. While staying with their great uncle Solomon, they discover secret scrolls that, with the roar of a lion, transport them back into ancient Bible times. The Great Escape sees the kids transported to Egypt during the times of the plagues. There they meet a princess, Shephara, and witness the plagues first hand- rivers of blood, uncountable frogs, gnats and flies, dead animals, boils, and finally the death of the firstborn children. In a race against time, the kids follow Moses into the desert chased by Pharaoh and the Grand Magician, trying to solve the secret of the hidden scroll before it is too late. In Journey to Jericho Mary and Peter discover their archeologist great uncle was once a spy. After explaining he had once discovered an artifact that could help prove the Bible was true, he told them he had since dedicated his life to that mission. Once again, the roar of a lion sends the kids on a new adventure, this time to the city of Jericho. There they meet Rahab and she helps them escape the city before its destruction. Written for ages 6-9, with a reading level of 1-3rd graders, these little books are admittedly a simple read for my son who is a sixth grader. None the less, we LOVE these stories and I highly recommend them for elementary and middle schoolers. They also make fabulous family read alouds- if you can commandeer them from your child's room. While they are fiction and embellished for the sake of fun, they do tell the intended Bible story well, backed with facts from the Bible. They are exciting, well written, and encourage faithfulness and steadfastness, as exhibited in the actions of the siblings, Peter and Mary who don't give up, even when afraid of overwhelmed. So how did we "use" these books? Well, of course as soon as they arrived in our mailbox they were whisked away by my son. We read the first two in the series out loud together, but this time he insisted that was silly and he knew how to read! Oh, how fast they grow up! As we do with all our our "school" books, (we are homeschoolers after all) I did require Colby to write a summary of each book after he read them. This helps me know he understood them, as well as continues to help him improve on his writing and summarizing skills. I typically have him write one paragraph about the book, and one paragraph on what he liked about the book. "The most exciting part is when they have to escape the man in black. I also like when they sneak into Jericho." "...it is exciting and it also shows you what happened in the Bible." "I really like when they get clues to solve the puzzles." If you are looking for a fun read for your kids, maybe even a fun Easter present, The Secret of the Hidden Scrolls series is one we think you will enjoy! Sixty fellow Crew members also had the opportunity to review The Secret of the Hidden Scrolls books, including three that have done amazing video reviews. By clicking on the banner below, you can see them all! I don't know about you but I for one am happy to be moving on from kitchens and dining rooms. I tend to want to eat in those places! ;) Hopefully by now yours are sparkling clean, a little less cluttered, AND are staying that way. Let's remember, all the cleaning and tossing in the world will not help us if we do not work hard to keep it that way. If we fail to put things where they belong, we achieve clutter. If we buy more things to fill in spaces, we achieve clutter. Make it your goal to not add back to your new spaces. Just enjoy the void for a while. You may be surprised at how good it feels. So let's talk for a minute about where things belong. We, meaning me mostly, have this motto in our house- everything has a home. You can sometimes hear me chanting it when no one is listening. I see something laying around and it bugs me. I pick it up, hand it to a child, and tell them to put it away. A few minutes later I see the same item, this time laying in a new location. I ask another child to put it away. Later I find it again in a new location. I will not even tell you how many times this may be repeated throughout a measly hour. Time for a family meeting. I ask, "Why do YOU ALL keep not putting this away where it belongs?!" Guess what they said??? "We have no idea where it belongs!" Well, there 'ya have it. No wonder things just migrated around some of my rooms. But here's the thing- even I did not know where several things belonged. How ridiculous. So we seriously went around the house identifying things that no one seemed to know where they went and then identified their homes. (The things, not the kids!) Some were fairly easy, but some we struggled with. Let me give you some examples- the laptops, the ipad, the girls' pocketbooks, the keys...you get the idea. If you cannot find a home for something, maybe you do not need said item! Identify where things go and then keep them there when not in use! If you walk around saying "everything has a home" long enough, they will get the idea. Ask me how I know this. OK, so this week we are on to the living room. Our living room is really not formal in this house, it is actually where we spend most of our day, outside of the kitchen. Since our family room is actually downstairs, this is the room most casual visitors see when they come through our front door so I work hard to keep it pretty straightened. For those who have been in my house since we moved her in September- yes, I have indeed changed it around a bit. Well, three times I believe, but who is counting? Other than my husband. This time I think we finally have it the way I want it, other than trying to have the hard wood floor extended after taking that funny section of carpet out and adding a rug. Baby steps. Your assignment- Clear the clutter and DEEP clean! Clear out your room as much as you can. I would include lamps, any decorations, pillows, blankets, and small pieces of furniture. Start up and work down, so for us that means ceiling fans and lights. UGH! For the record I have someone other than me who is not bothered by heights get on the ladder, not me. Some chances are just not worth taking. Wipe off all light switches- they are dirty! Trust me! Wax/dust furniture. Not just the top like I assume most of us do weekly, but ALL OVER! We actually used a wood cleaner as opposed to a wax or dusting spray to get the job done. I figured after three months in storage, our stuff needed a major clean. Wipe down all of the knick knacks you had on said furniture and try to put only half back! ;) Now is the time to get rid of the things that are just taking up space. Look at it this way, the more you have sitting out, the more you have to dust each week. Ask yourself, do I love this or is it just taking up space? Let's try to surround ourselves with only the things we love! Vacuum off your lamp shades. I am amazed at how dusty they can get! If you have leather furniture, now is a great time to really wipe it down. We love ours, but just like other non-fabric surfaces, little fingers get it dirty. If you have cloth furniture, vacuum it. Wash blankets and any throws you have laying around. You can even take this time to switch one out for one in another part of the house. Sometimes just a simple change can make you feel better about your space. I do this frequently, depending on the season. We admittedly have a plethora of quilts and blankets, but they get used around here! Pull the larger furniture out from the walls and wipe down all the baseboards. Take vent covers off and wipe down or vacuum out. Intake vents especially get dusty. While the furniture is out from the walls, vacuum around the edges of the carpet. -As as long as all the furniture is out from the walls, rearrange. Oh, wait, that may be just me! ;) Remember, this family has moved a lot. Emphasis on A LOT! So when we get to stay in one place say, for more than six months, we tend to get antsy and rearrange furniture. True story - when my oldest was about five and daddy was gone for a few months, I rearranged the living room. She stood in the middle of the room crying, "put it back, put it back, daddy won't like it!" Don't even ask how she reacted when I painted! Luckily, she is now the Queen of Rearranging and I am happy to say did not cry once during this project! As a matter of fact, I am pretty sure her recent experience with staging houses was right up her alley because I have given her so much practice. You are most welcome, Ashton! -If you move furniture around a lot, you need these Sliding Robot things! We love them! On to windows. UGH! We have large windows in our house, so a step-ladder was needed but I did get it done. Start with the blinds then move on to the windows. The larger wooden slat blinds are easier to clean, I must say. I dust them weekly but this time I used a wood cleaner to deep clean. - Two quick tricks if you do have blinds- if it is easy to do, just take the blinds down, stick them in the bath tub, and bribe pay your kids to scrub them! Tell them it is like pool fun, but better. - If you are too lazy to do that, just spray them down while still hanging, start from the top and scrub away. Make sure that after you finish the blinds you raise them and clean the windows since they will now be gross, too! - And about those curtains. When is the last time yours were washed? Fess up! We have very few hanging for two reasons. The biggest is because I refused to buy curtains to fit every window of every house we live in and I got used to doing without. The second is because as much as I like the look, they do collect dust and are not the best for our oldest and her allergies. Anywho- if you have them, take them down and wash them. You may even decide to leave them down for the season and let the light shine in! Actually, we only have curtains in one room in our new house and I love it! Lastly, give the room a good vacuum. Now is an even better time to steam clean your carpets! We own a steam cleaner attachment for our vacuum, but if you do not, see if you can borrow one from a friend or rent one- many grocery stores even do this now. Cleaning carpets twice a year is a good habit to get into and can extend the life of your carpets! If you have wood floors, sweep and mop. Are you tired yet? I am! This year I did not have a helper other than the ceiling fan and regardless of the smaller space, this was not a quick project. But as I sit here typing a recap I can look around and smile- it looks tidy, smells clean, and hopefully says WELCOME! Your turn to work on those Living Rooms! Can't wait to see what you do. Make sure to leave us your pictures on our Family, Faith and Fridays Facebook page. We love seeing your progress and cheering you on! OK, I am going to just jump in feet first and say it- I am so excited about this week's challenge. Why, you ask? One, we are DONE with the kitchen. Finally. And two, because my new dining room is pretty simple. Dining rooms tend to be areas that only get used a few times a year and otherwise go unnoticed. This one is getting a lot more use than usual with all of our visitors, and in our case, it doubles as a school room, but that's another post! If you have a separate eat-in area of your kitchen, include that in this week's assignment. Clear everything out! That means empty drawers and clear off flat surfaces. Once a room is fairly empty it is easier to clean. Now that those furniture pieces are cleared out, time to clean them up and make them shine! Clean top to bottom. I love to Murphy's Oil Soap a few times a year, but up to you! Pull all the furniture out from the walls and clean behind each piece, vacuuming or mopping, whichever is applicable. Now is also the time to deep clean your table and chairs. If you have one in the kitchen, sorry, but go back and hit it, too. Not just the top, but the legs and all. Chairs too! Just think about how many dirty hands touch the rungs and sides of chairs. Ok, don't think about it- just scrub! Other areas to clean- mini blinds (did I tell you I loathe mini blinds? ), windows, curtains (yes, take them down and wash them), chair rails, light switches, and chandeliers. This is the time to get it all. Last big area, the floor. Just like in the kitchen, work your way around the baseboards and then on to the floor. So all that stuff you pulled out of the buffet and such- time to declutter! Evaluate and purge what you do not need, then put it back, neatly please. We are currently using this dresser as a "hutch" because my daughter doesn't want it in her bedroom. This is actually the third house we have done this in, and it has grown on me. Inside it are things like placemats, tablecloths, and a few silver trays I use for entertaining. After weeding out so much last year, we can now house school supplies in the six outer drawers. Yay me! A few notes, especially for those of you with formal dining rooms! -So here's the deal- grandma's china may be lovely but if it does not get used it is just taking up space. If you love it and use it, keep it. If not, give it to someone who will. A few years ago I finally let go of one of our Christmas china sets. Now I have only one, but someone somewhere is now enjoying the other set (I hope). Win win! - Almost 25 years ago I thought it was a great idea to register for 12 wine glasses and 12 champagne glasses, along with 12 of a lot of other things I did not need or use. Eventually I gave our movers a break and passed them on (you are welcome!). Yes, they were pretty, no they were not necessary. Ask yourself if everything you have you really need. -Yes, I admittedly own several sets of dishes. (Although not Christmas ones anymore!) I promise I often feed large groups at a time and I use them. ;) Again, if you use it, keep it. If it is just sitting around for some day, it may be time to let it go. -Yes, you CAN have too many tablecloths and placemats. Ask me how I know. I now have a few less. Grandma's old "antique" tablecloth was lovely, but, with a few holes in it, I was not going to use it. Sensibility trumped sentimentality. I think she would understand. -If you entertain and can justify owning glass plates and a punch bowl, by all means keep them. I do. But if not, most churches have sets like that and are usually more than happy to let you borrow theirs in a pinch. Again, make decisions that are right for you and then be happy with those decisions. The local Goodwill store likes us these days! Tired yet? Trust me, this is probably not going to be a one-day job for most of you. If you do not have a dining room at all, then make that kitchen table sparkle and reward yourself with a treat. Chocolate works great! 6 weeks of challenges down! How are you doing? We love seeing all of your pictures each week and are amazed at all of the people still with us. OK friends, with your recipes done we are ready to embark on our final push for the kitchen. After this we will really only spend one week in each "area" of our house so be ready for some serious digging in! But this week- we should have called this "the week that almost did not happen!" Seriously! The first time we tackled 34 Weeks of Clean years ago my friend, Cristi, from Through the Calm and Through the Storm reminded me of Kitchen Countertops! I personally did that when we did the cabinets, but failed to mention it to you. SOOOOOOOOO, if you have not tackled that area yet, today is going to be the day. And the loose ends- are you ready? The Stove/Oven and Microwave, tops of cabinets, windows, blinds, and light fixtures. Hang in there - I promise this is the end of this room! The good news is that after this deep cleaning we should only need a light weekly maintenance to keep it sparkling. At least that is my story and to keep you as friends I am sticking to it. Clear/clean off any counter top space you have! Clear them off, clean them up, and see if you can keep them clear! Now THAT is the challenge. Is it just me? We always seem to have one place that collects things- let's just say the battle is real, friends! Get rid of the piles you have sitting there (I KNOW I cannot be the only one) and resolve to not let them creep back up on you by next week...or tomorrow. 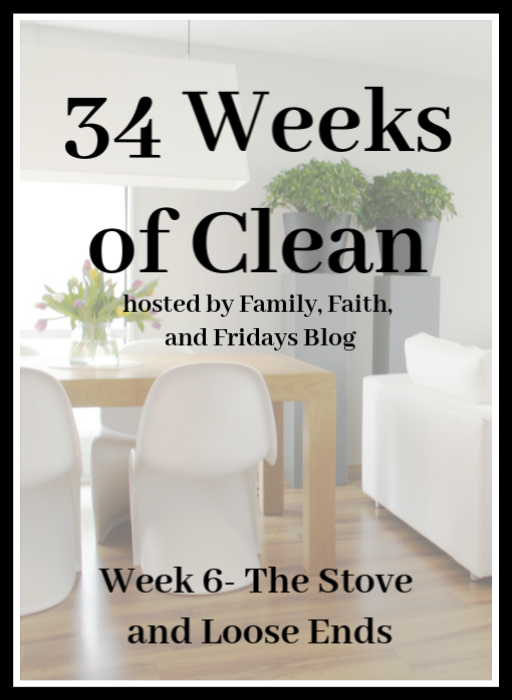 I challenge you to only put half of what you take off those counter tops back- it might seem stark at first but you will be surprised at how much neater it will look and how much more prep space you will have. Out with the clutter, my friends! That pile has GOT to go! It is a constant battle. Stove/Oven- This is a good job for a maid, but since I cannot convince my hubby I need one, I guess I am the one tackling this one. Yay for automatic oven cleaners, yuck for the burnt smell no matter what. I admire you who can keep the bottom of your oven clean. I am not one of those people (obviously). I have tried. I have failed. Crack your door or window if you can to get rid of the smell! And for the record- who else thinks that those pizzas that say cook directly on the shelf should be outlawed? I mean really, who thought melting cheese dripping all over the oven was a good idea? No more, I tell 'ya! Hopefully a little baking soda, vinegar and hot water will make this good as new. I will keep you posted! I have had a love/hate relationship with my past gas stoves, but I do love the one in our new house. Praise be to the woman who begged her husband to put it in. Shame on him though for allowing her to put in TWO stoves. And dishwashers! But I digress. Anyway, this one is is much easier to pull apart and clean. Which is a good thing because while my husband's cooking skills are good, he and his bacon are messy! Tops of cabinets. Make sure you not only take all that decorative stuff off the tops and wash off the LAYERS of dust, (anyone else? ), but then also take the time to vacuum or wipe the layer of dust off the cabinets. If you have blinds in your kitchen, now is the time to wash them down. You can dust them on a regular basis, but they do occasionally need a good, deep cleaning! I have taken ours down in the past and put them in the tub, but our current ones are wood so I just do them slat by slat. If you have curtains (smart you! ), just wash them and rehang. While you are there, wash those windows and wipe down the ledges! And last but not least, wipe off any light fixtures you may have in your kitchen, replace any burned out lights, and check your fire extinguishers. If you do ot have one, these new small ones are handy to have around and be found at Walmart and such. Consider this your friendly public service announcement. You are welcome. Wow! We are DONE with the kitchen! Take a step back, admire your hard work and pat yourself on the back! Imagine me cheering yay you! You did it! Let me also take a second to encourage you to keep moving forward. We all have busy lives. Some weeks are crazier than others. Sometimes we get a lot done, other times we should just celebrate that the children got fed and bathed, right? It's ok! Embrace the life the Lord has given you and celebrate the time you have to enjoy it! Next week we are moving out of the kitchen- get ready! 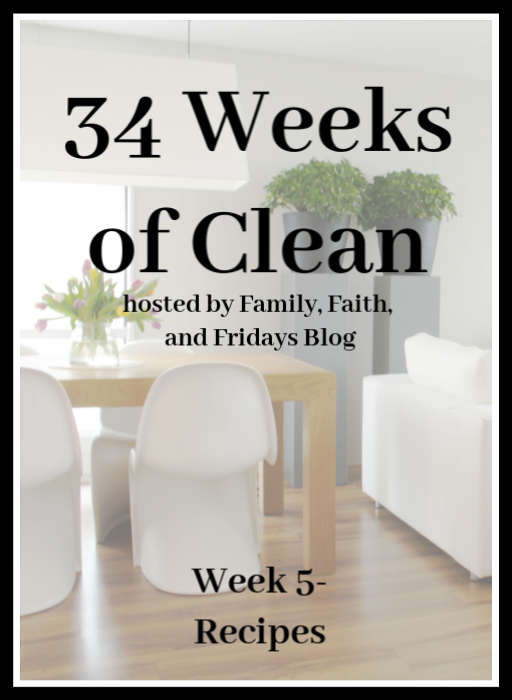 Since we are 4 weeks deep in our 34 Weeks of Clean series, I have gotten several questions about our weekly cleaning schedule. No, for the record, I do not ignore the rest of the house while we "34 week" it! While we do concentrate on one area a week for deep cleaning, decluttering and organizing, there are still other places in the house that get dirty through the week and have to be cleaned. Bummer, right!? Let me begin by telling you I do not believe there is a right and wrong way to do this. I have tried many different ways and in different seasons, some have worked better than others. This is just where we are now. When I was a kid I helped my mom clean on Saturday mornings. I use the term "morning" lightly, because I am an only child, and it took the two of us a long while to clean. (She did hire someone to help her AFTER I left for college, true story!) I remember often putting on loud music and the two of us working until the whole house was done. If you didn't work, you didn't play later. I am sure I did a lot of complaining then but I look back at those days with a smile. Projects are always more fun with friends, right! And they often get done more quickly. That being said, I do not do our house all in one day at this point in my life. My two girls are grown and the boys, well, we would just not do as well as I would like. So here is my method, quite similar to my 34 Weeks method. One room or area a day! Here's what it looks like for me- And yes, I have it posted because I cannot remember one minute to the next, more or less one week to another! Now I know that leaves some spaces, but that is where my family and team work come in. They also have a similar chart, but with their areas in it. So the boys both have days for their laundry, bedrooms, their bathroom, taking out trash, scooping the yard, etc. My oldest kindly keeps up with our third floor, the kitchen there included, as that is where she lives currently. 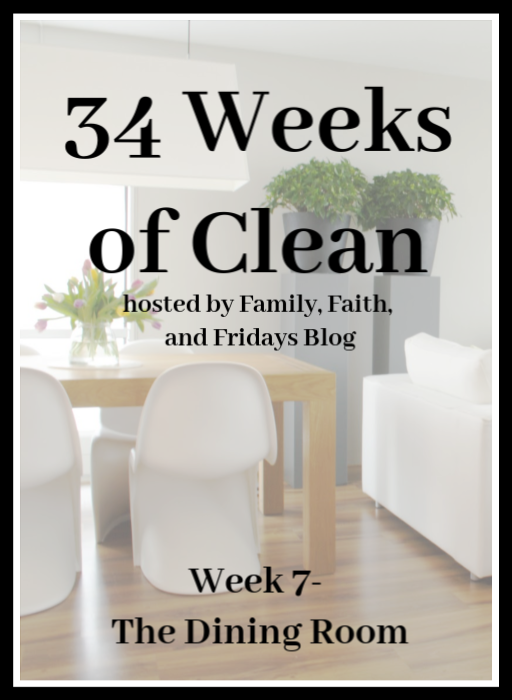 Keep in mind, this is weekly cleaning, not necessarily deep cleaning. I do try to do baseboards the first week of each month, and because I have learned the hard way, I do the blinds in each room weekly now. Proof that you can teach an old dog new tricks! In a perfect world it works great! News flash- we do not live in a perfect world, so some days get missed and the next day I have to double up. Such is life, but in general I try hard to stick with the plan. Is it a perfect solution? Maybe not, but it works for us. Give it a go, see what you think, and adjust to your needs in this season!